I really appreciated the opportunity to experience CIT’s Italy. We had a very comprehensive itinerary in 8 days. We visited many places and experienced many aspects of what CIT can offer to our clients. Etihad to Milan. It was a very pleasant surprise when I checked in for my flight and received an upgrade to Business class. The new Etihad lounge at Melbourne Airport is wonderful. It has both cook to order and a buffet option. The On board Crew were very attentive and it was a terrific start to the journey. The onboard experience with Etihad was excellent. Very comfortable seat and fully laid flat bed. All meals are made and served to each individuals request. The flight attendants were delightful and responded very quickly to any request. I did not use the Pajamas but thought it was a nice touch. We arrived from Melbourne and met the rest of the group in Abu Dhabi. The lounge was again superb and most opted to have a shower. The flight from Abu Dhabi to Milan was of equal quality as the flight from Melbourne. This also reminded me to advise Business Class passengers about the Fast Track passes to get them through Customs and Immigration faster. A definite selling point. I arrived into Milan feeling quite well rested. We were met by our host Leanne and a driver for the rather long trip into Milan. I would recommend the train from the airport as it is much quicker and less expensive, taking you directly into Centrale Station. Our hotel in Milan was the Antares Hotel Concorde a 4* hotel in the CIT brochure. This hotel was very comfortable and the rooms were spacious. Though the location is 7 stops on the metro to get into the Duomo area, it was very easy to purchase tickets and the service was prompt and clean. The rooms were not ready as we arrived early in the morning but the hotel provided storage for our bags and we enjoyed a welcomed breakfast. 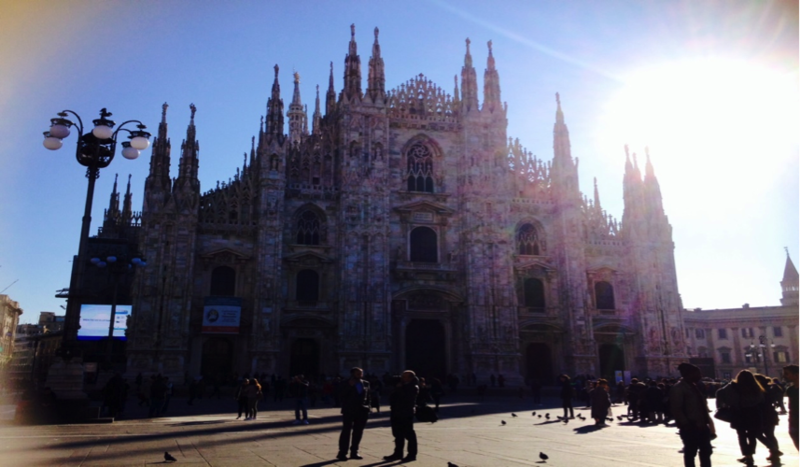 We then took a coach/walking tour of Milan with an interesting and well informed local guide. Our tour took in the historic area around the Duomo, the Galleria, La Scala Theatre, Piazza Castello and the Sforza Castle. I saw many of the hotels I have booked for our clients but I did not have an opportunity to do any hotel inspections. My two favourite areas were Via Buenos Aires (shopping) and Brera (Artist District). We enjoyed aperitivo (pre dinner drinks) at a local café and then headed to a local Italian restaurant for a massive 10 course meal. We had some spare time before our train trip so a group of us caught the Metro into the Duomo. From there we enjoyed a coffee at a café opposite the Duomo, shopping and people watching. Milan is a very elegant city. We were transferred by coach to Centrale for our train to Sestri Levante. I was quite surprised by the army presence and security at the station but it was reassuring. There were many food outlets and good facilities within the station. There is a service area where you go to have your Eurail pass validated and clients need to allow a bit of time for this process. It is also really important that clients are told to look for their train number and not their destination to locate the departure platform. We travelled on the Trenitalia service in first class and it was very comfortable and clean. Bags were stored between the groups of seats. Unfortunately the train line was hit by a typoon and we had to disembark in Genoa and wait for vans to come and get us to the hotel. We managed to find a very comfortable café and made the most of the down time. We were collected by two off duty paramedics who then treated us to Italian style driving – fast and risky. When we reached 180km the driver reached for his seatbelt and picked up his mobile phone! We arrived at the hotel quite late and immediately had to go to dinner in their restaurant. It was a very pleasant meal. The hotel was the Grande Albergo Sestri Levante and it was right on the waterfront. 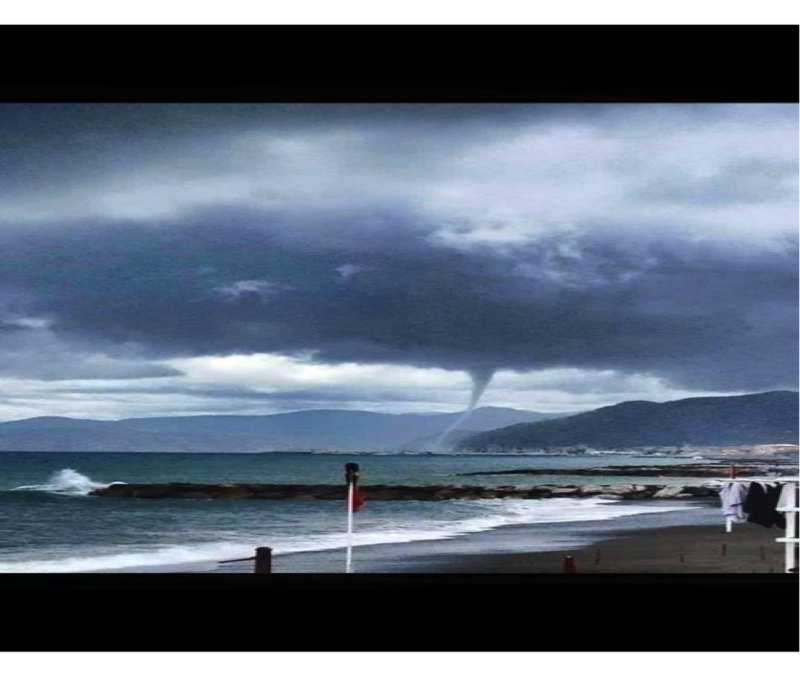 The typhoon had made a mess of the beachfront but you could see what a lovely place it would be normally. This hotel is also a 4* property and in the CIT brochure under Liguria and Cinque Terre. This would be a good alternative to staying on the Cinque Terre itself as you have good access to the entire area by rail. After a good breakfast we headed to the station to take a train to the Cinque Terre. We used our Eurail pass for this train but had to buy one day tickets for the Cinque Terra train services on arrival at Monterosso. The attendant at the station was not very helpful and again we need to explain this process to our clients before they go. 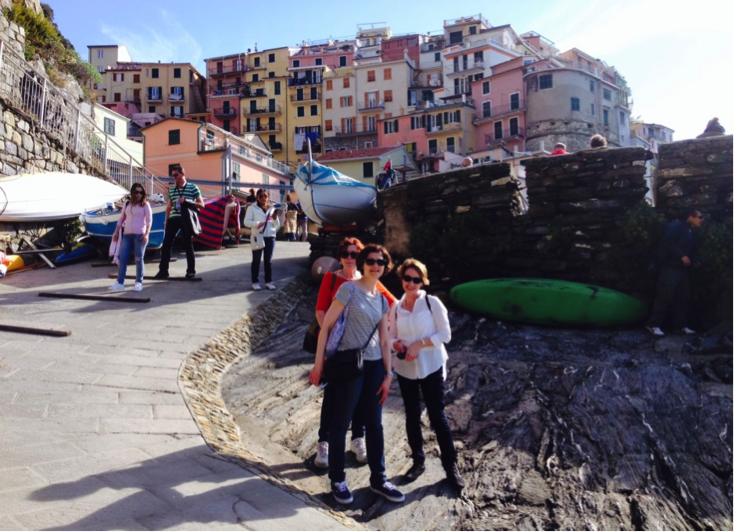 A small group of us then took the train to the furtherest of the five villages, Riomaggiore. From here you would normally do the Lovers Lane walk to Manarola however all of the walks were closed due to the weather and fallen trees. We had a good walk around the village and stopped and had lunch at one of the local restaurants. The local seafood was magnificent. 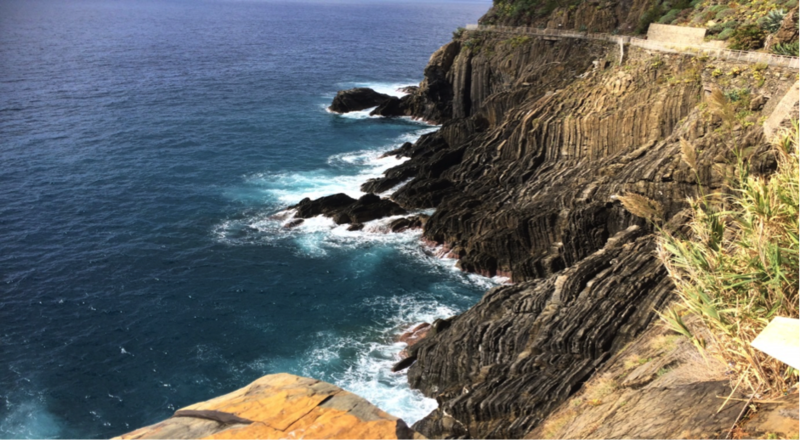 It was then a short train ride to Manarola. This was probably my favourite of the villages. I also managed to inspect the Hotel Marina Piccola which I have booked quite a number of times. It proved to be exactly as I had hoped. Great location with nice modern clean rooms and bathrooms. This was followed by another short train trip to Comiglia. This town is at the top of the clifts and we waited for the local bus to get to the top. A very quaint village and good gelati. Off to Vernazza, probably the most recognisable of the villages. Great waterfront access, good shopping but very busy even in October. Not sure about this one in July! Returned to Monterosso and a quick walk around the old town. There is so much going on in this village and this would be my second favourite. They have all sorts of events, good shopping and plently of places to sit with a view and enjoy food or a drink. October is the very end of the season in these villages and most businesses close down for the rest of the year. Many of the hotels close so if travelling in the off season I would suggest staying in one of the larger places. 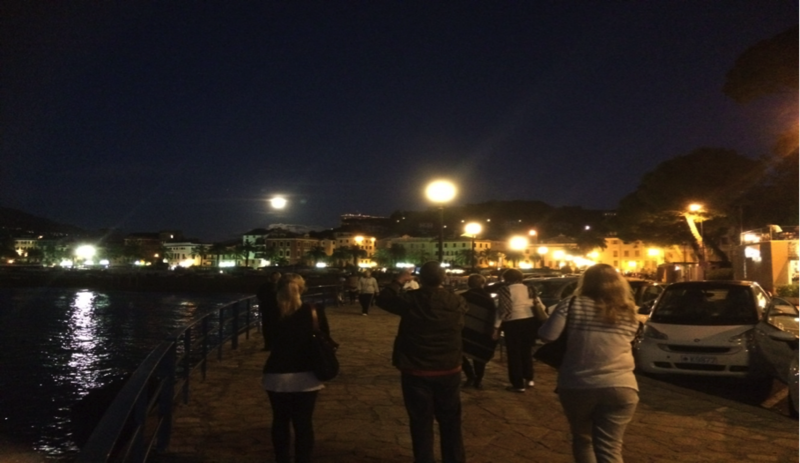 We headed back to Sestri Levante for an evening walk along the waterfront and dinner in a local restaurant. Another train journey to Pisa this time. The train was delayed and we waited at the station for at least an hour. When the train did arrive it was again clean and easy to manage. Upon arrival we were transferred directly to Barbialla where we enjoyed lunch made with all local products. This is part of the Ecologgia program where members must only provide local produce. Then into some four wheel drive vehicles in our gumboots for a truffle hunt. This was a rather ardous exercise and only 4 of us lasted to the very end. We found 1 truffle and I wondered at the dedication of the tarufaio and his dogs. Then it was off to Signa and the Villa Panolfini for two nights. This is a remarkable private residence made up of several Villas. The owners live on the second floor. The villas were very large and had multiple bedrooms and bathrooms. This was a big change from the cosy 4* hotels we had been in previously. It was not really to my liking but I can see the appeal to some. 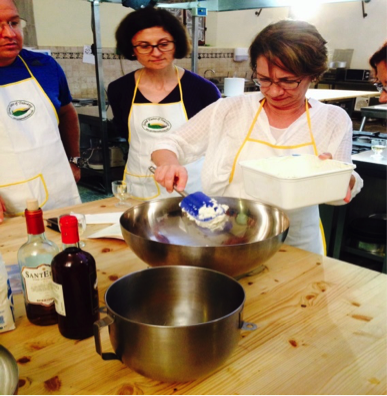 Big family groups that really wanted to experience rural life in Italy would love it. In Italy you are not permitted to turn your heating on before November and these villas were freezing. Clients may also be need to be reminded of this prior to travelling. Across the road from the villa is their cooking school. People come from far and wide to attend 1, 2 3 and 4 week courses. We cooked a four course menu over 5 hours and then sat and ate it. This was really interesting and lots of fun. Having fun at Cooking School? Nothing could keep me awake after this and the cold didn’t bother me at all! A local train to Florence this morning. Purchased tickets at the machine below the station – a very easy process. Must remind clients that these tickets still need to be waved under the validating machine on the platform before boarding the train. This train was very crowded but clean and comfortable for the 20 minute journey. We were met in Florence by a local guide for our 3 hour walking tour. The guide was very interesting and well informed. I love Florence and think it may be my most favourite city in the world. Being a Monday none of the museums were open and it was still quite crowded. Again I saw many hotels that we book but did not do any inspections. After the tour I opted to spend the rest of the day in Florence but some of the group headed back to the Villa. There were several big markets on, the Ponte Vecchio was buzzing and the people watching was amazing. Joined the rest of the group for dinner in Florence at a lovely local restaurant. A coach transfer to Florence and the S M Novella for our Business class Trenitalia service to Rome. This was a very nice trip with drinks and snacks served. It really is a great way to travel. Luggage was stored in a special area at the end of the carriage. You do need to be a little prepared before your destination as the bags were piled on top of each other and you could get caught and miss your stop. Again a lot of security at the stations but again this was kind of reassuring. We stayed at the Accademia Hotel which I think all of us would have booked at some stage. This is a 3* hotel that has been in CIT brochures for as long as I can remember. It is in a great location near the Trevi Fountain. Rooms are quite small but very comfortable with everything you need. They have a public shower/bathroom on the 1st floor which was very handy for late departures from Rome. 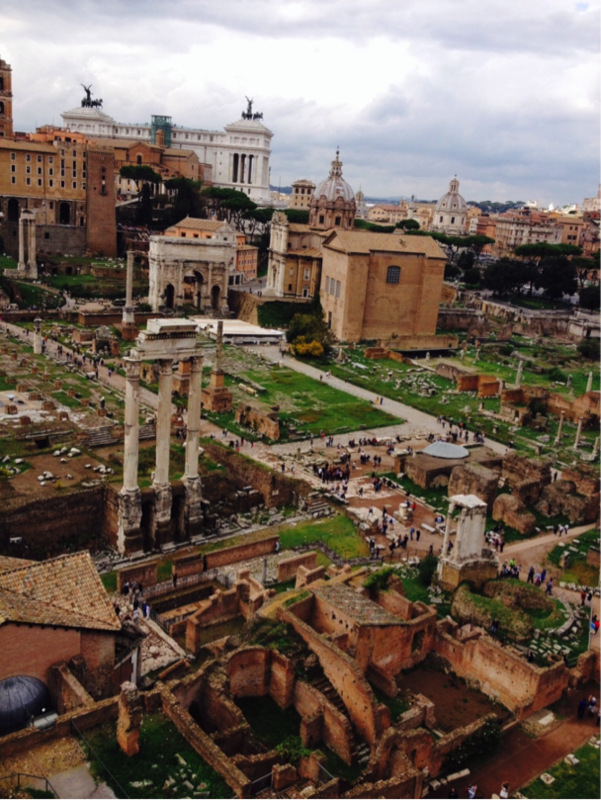 We had some free time in Rome so I went walking with a small group and covered a vast number of sights. Also saw a number of hotels I was familiar with. 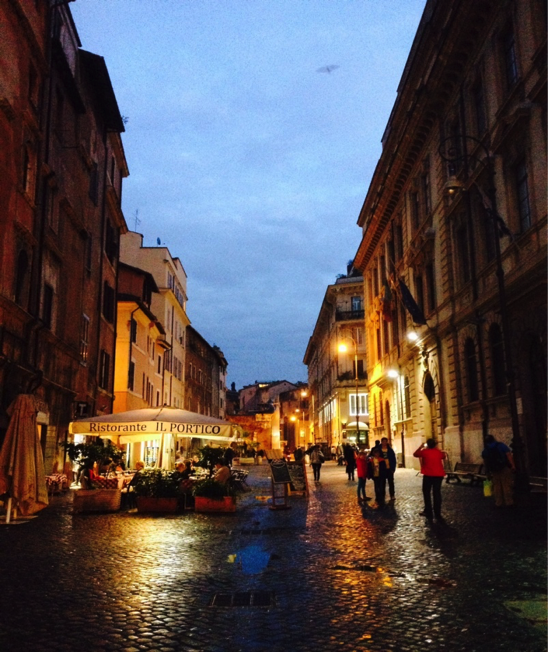 I really liked the Piazza Navona area. In the evening we had a tasting tour which started in the flower market (Campo de Fiori) followed by four local food outlets finishing in Trastevere. This area has really changed and is full of restaurants and bars. Lots of people out enjoying the evening either walking or eating. The other interesting area was the old Jewish ghetto. We started today with a Vatican Museum and Sistine Chapel tour which was really worthwhile but quite a lot of queuing and a lot of time seemed to be wasted. We were in quite a big group and I would strongly recommend that we book our clients on small group tours with early access. One bonus was that we saw the Pope as he was in the square being a Wednesday morning. What a massive crowd he gathers. Buses were a bit tricky to negotiate from the Vatican back into the Colosseum for our next tour. We had a quick lunch between tours and then onto the Forum followed by the Colosseumn. Again we were part of a large group and there was quite a bit of waiting around. At some stage half the group stopped at a bathroom! This is an ardous tour with quite a few stairs and uneven grounds. Again worthwhile and an amazing project. Look for small group and priority tours wherever possible. Back to the hotel for a quick shower and change before transferring to the airport for our trip home. I travelled from Rome to Abu Dhabi in economy class and it was good. The plane was very full and I was pleased to be seated at the rear of the aircraft in a row of two seats only. Food service was a bit slow and the meals ok. Had I not travelled the other legs in Business class I would probably rate it higher. The new lounge at Abu Dhabi airport is amazing. It is very large and offers lots of services to guests. I had a manicure to waste the four hour connection. The food and service was wonderful. Others enjoyed a massage in the Spa. Upgraded at the gate to business class for the long trip home. This was really appreciated and this time I changed into the pajamas and seriously slept. Again the inflight service, food and entertainment were fabulous. I thoroughly enjoyed my experience with Etihad Airways and CIT. Italy is a wonderful destination and having this taste reminded me how much I loved Italy and want to see more.